My name is Yiliu Zhang, a freshman planning on majoring in political science. I am spending my IAP in Madrid, Spain, as a participant of MIT’s IAP-Madrid program. Every weekday morning, I have Spanish class for three hours, and then I’m free to explore the city. Learning a language is a nice break from working on problem sets! In the evenings, my fellow program participants and I typically eat dinner with our respective host families. Afterwards, we head out to experience Madrid’s nightlife, which begins and ends much later than in the United States. Last weekend, Yiliu and six others toured Granada in southern Spain. The town is most famous for the Alhambra, a Moorish fortification and palace. Pictured, Yiliu against the backdrop of the city, where the homes are whitewashed to cool the houses during summer. My host family only speaks Spanish to me, and my Spanish listening and speaking skills have definitely improved as a result. And my host grandmother’s cooking is phenomenal! Her tortilla Española and cauliflower cream casserole are amazing. As an MIT student, I am fortunate to study in an institute of science and technology. I’m also excited about opportunities in the humanities such as the IAP-Madrid program. My classmates and I made the best of our allotted time to fully experience the Spanish culture. The highlights of the trip for me were visiting the Prado museum (seeing Velázquez and Bosch paintings especially), visiting the Reina Sofia contemporary art museum (Picasso’s Guernica was very impressive), walking through the city of Madrid, admiring the Moorish fortification Alhambra in Granada, and discussing American foreign policy and Spanish economic issues with my host mother and host grandmother. Some of the IAP-Madrid participants. I truly believe you have to immerse yourself in a culture to genuinely love and understand it. For me, studying abroad in Spain has been as much about discovering the Spanish culture as expanding my perspective. For instance, my host mother and I had a long chat one night about the field of humanitarian law and international development. Also, my host grandmother loves to berate Zapatero, the Spanish president, whenever I mention politics. When I was shopping in a store owned by a Chinese immigrant, I had an interesting conversation about being a Chinese immigrant in Spain. Even though the museum artworks and the public parks are gorgeous, I think the people I’ve met in Spain have affected me more. In short, I feel more like a global citizen after immersing myself in the everyday life of the Spanish people. In case you missed this year’s Mystery Hunt, here’s a quick glimpse of all the hoopla and excitement, from the puzzle creators’ headquarters to team rooms abuzz with strategies for solving puzzles. Find out why the 29-year-old Hunt is still so alluring, just how global teams are, and the best food to make it through the long weekend (which is far more sophisticated than the Doritos and Mountain Dew of yore). Also check out a map of Mystery Hunt coin locations—complete with fun anecdotes—since the Hunt’s inception and learn about the Hunt’s origins. And yes, you will see plenty of R2D2, who so graciously posed for the camera and cheered on team R2Disco but who did not, alas, sign my autograph book. (Sigh.) Maybe next year. For more Mystery Hunt fun, check out short movie “swedes” (remakes) created by the teams as required by one of the puzzles. Team Palindrome has a funny rendition of Raiders of the Lost Ark. Others can be found in the Related Videos column. From left: Shane Torchiana and his externship sponsor, Umber Ahmad ’94. After working in asset management for a few years before coming to MIT, I was expecting more of the same out of my externship at Platinum Gate Capital Management. But, as has a tendency to happen, life has thrown a curveball. The past couple weeks have been more interesting than any other professional experience I’ve had. Being asked to do things like travel to the UAE or hang out backstage at a Victoria’s Secret fashion show have made my days here anything but run of the mill. Many would call Platinum Gate a multidisciplined asset manager—i.e. hedge fund—but in essence it is a group that links those seeking capital in the U.S. to those able to provide it—in abundance—in the Middle East. They serve as a literal platinum gate through which capital can pass. Generally, the company deals with private equity/venture capital transactions as well as project finance, but mandates continually evolve to meet clients’ needs. The firm is a new one, headed by the affable sibling duo of Jolyne and Joseph Caruso. Most recently, they were Lehman executives who individually had the foresight—or perhaps luck—to get out while the firm was still standing. Within Platinum Gate, Jolyne runs a top-notch investments team here in New York, while Joe and his team primarily handle relationships out of the Dubai office. Joe started the firm not long after he left Lehman a year and a half ago and Jolyne joined him this past summer, opening the New York office and bringing in an impressive investments team. One member of that team is Umber Ahmad, a 1994 MIT grad who went on to get an MPH from Michigan and an MBA from Wharton. After working in the Goldman Sachs Private Equity Group, she cofounded Goldenridge Capital and more recently joined Platinum Gate as a director. Luckily for me, Umber was kind enough to put out a posting for an extern this winter, which is how I landed at Platinum Gate. 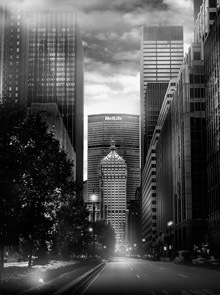 New York offices of Platinum Gate Capital Management. I came in as an investments intern, not entirely sure of what I’d be doing at this new company. As I’ve alluded to, the experience has far exceeded my expectations of what an internship could be. From day one I was meeting with an eclectic mix of impressive and interesting clients, from sports team owners to Hollywood super-agents to mega-farm entrepreneurs. This was done working closely with the CIO, Adam Goodfriend—another banking & hedge fund all-star—and even the president, Jolyne. Having the opportunity to originate work on a billion-dollar clean energy deal right out of the gate was not something I expected, but that and other experiences like it have come as a nice surprise. It has been a wild ride thus far, one in which I have had the opportunity to work with outstanding people at every turn. Already I have learned quite a bit about the deal side of the business, using the financial skills I’ve honed at MIT to help work out mutually beneficial capital allocations. In what appears to be a happy ending, it looks as if there might be an opportunity for permanent employment here as well. This has been a great experience that I can thank MIT and Platinum Gate for providing. Happy 30…er…29th Birthday, Mystery Hunt! Click map to find out where all the Mystery Hunt coins, 1981-present, have been hidden. A few months ago, I began a project in honor of the 30th anniversary of the MIT Mystery Hunt—a map indicating all the coin locations over the years. Hunt originator Brad Schaefer ’78, PhD ’83 suggested it as a fitting tribute. The Mystery Hunt archives page and a lengthy, detailed article from the July 1991 issue of Games magazine, written by Hunt veteran Eric Albert, stated that the Hunt began in 1980. However, after extensive research and dozens of emails to past puzzle creators and participants (including Schaefer and Albert), one thing became clear. The Mystery Hunt actually began in 1981. It’s only 29. No matter. This anniversary may not technically be a milestone, but it is the 30th time the Hunt is being played. So we’ll just go with that. Learn more about the origins of the Hunt. Where to hide the coin can be a challenge. The location has to be accessible at all hours; impervious to outside forces like rain, squirrels, or cleaning crews; and easy to designate with clues—a lesson Schaefer learned during the first-ever Hunt when a mezzanine level he wasn’t aware of caused some participants to break into a librarian’s office (see 1981 on the map). In early Hunts, puzzle creators (usually one or two people) waited for teams to call when they arrived at the final solution. These days, the endgame includes a massive runaround with teams (often accompanied by puzzle creators) traversing campus based on an intricate set of instructions. Coins have evolved. Puzzle originator Brad Schaefer chose an Indian Head penny for its uniqueness, size, and indestructible nature. The 2008 coin, above, featured the thumbprint of Dr. Awkward's murderer, whom hunters had to identify. Each winning team member received one of these coins. Photo: nonelvis/flickr.com. So what can be gleaned from this map? Buildings 4, 24, and 7 have each been used the most (three times) as hiding spots. East campus has only been used once, in 2006. Only two spots have been outdoors. And basements are especially popular—they’ve been used eight times. Check out the map and click on the coins for more insights and anecdotes, including when the first brute-force solution was required, what year the coin was hidden in someone’s pants, and which year even the puzzle creators didn’t know where the coin was hidden. Also, please let us know if you have additional anecdotes or if you can supply any of the following information: the location of the ever-elusive 1992 coin (the only year, regrettably, not accounted for), the location of the large-team puzzle in 1986 (there were two versions that year), or confirmation for 1991 and 1997 (which were best guesses by those puzzle creators). Either reply in the comments or fill out our quick form. Update: Check out video from the 2010 Mystery Hunt, where R2D2 made an appearance. This is the first in a series of posts exploring Independent Activities Period (IAP) from students’ perspectives. Sandra mentoring students on their project. Hello from South Bend, Indiana! My name is Sandra Chen, a sophomore in the mechanical engineering department spending the first week of IAP, Jan 4–8, participating in the MIT Women’s Initiative Program. This is a student-run group whose mission is to encourage more women to pursue degrees and careers in engineering starting at the middle-school level. My partner, Elizabeth Kowalski (grad student, Department of Electrical Engineering and Computer Science), and I were selected to present about engineering to young girls curious to learn. 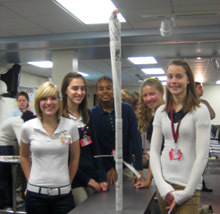 South Bend Middle School students having fun building their paper tower. In addition, we also described our research to the girls to get the students thinking about how engineers contribute to society. In terms of research, Elizabeth works on the U.S.’s contribution to the International Thermonuclear Experimental Reactor (ITER) project focusing on fusion energy. I conduct research on drug delivery and development. Besides presenting, we also explored the scenic campus of Notre Dame, viewed artwork in the Snite Museum, and had delicious bread bowls at the Chocolate Cafe in downtown South Bend. 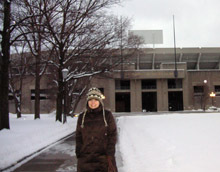 Pictured, Elizabeth in front of the Notre Dame football stadium. We incorporated an activity in our presentation where the students were assigned to build the tallest free-standing tower without any other materials besides two pieces of newspaper and imagination. The goal was for the students to gain hands-on knowledge on what an engineer, in this case a civil engineer, might do on a daily basis. The students were very curious and asked a variety of questions pertaining to being an engineer and about our research! Learn more about the MIT Women’s Initiative. Are You a Poster Child of Charm? Coordinators of Charm School, that much-beloved Independent Activities Period (IAP) tradition where MIT students brush up on various life skills, are looking for alumni to extol the real-world virtues of these proficiencies—such as table manners and handshaking—to illustrate their value. Has your mastery of small talk or networking helped you get ahead or make an important connection? Do you rock the art of nonverbal communication? Has your ability to handle difficult people or situations earned you praise? If so, please submit a quote for possible inclusion on posters to be displayed at the Jan. 29 Charm School session. Check out a list of possible topics to comment on. You don’t need to have attended Charm School; you just have to indicate how your mastery of etiquette, manners, communication, and/or personal skills have benefitted you at some point in your life. Please submit quotes by Dec. 16 and include your degree year and course number(s) and current occupation/endeavors. If you prefer to disseminate your wisdom in person, volunteer to be on the Charm School “faculty” and run a course. Or, if you want to learn some life skills yourself, feel free to join in the fun on Jan. 29, 2010, from noon–4:00 p.m. at the Stratton Student Center. Student externs analyzed and tested advanced composite aircraft structures at Aurora Flight Sciences. Maybe layoffs have left you shorthanded and doing the work of two or three people. Or important projects have fallen by the wayside because you can’t hire that new person you were counting on. Perhaps your company needs to find employees with a particular mix of skills, future summer interns, or an inexpensive way to market to the right potential workers. A little creativity can help employers and employees weather the economic crisis. Here’s one solution: access and audition top talent for free by hosting an externship this January during Independent Activities Period, Jan. 4–29, 2010, for MIT undergrads or graduate students. Opportunities may range from one week up to the full month and typically provide meaningful challenges for students, be it with research, lab work, data analysis, software development, project planning, or more. Past experiences have included helping research, design, and build an interactive, live-action spy challenge with 5 Wits Productions; working on computer vision in radiation oncology at Mass General Hospital; and analyzing and testing advanced composite aircraft structures at Aurora Flight Sciences (pictured). Discover other externship opportunities students have had and how they’ve launched careers. Companies of all sizes are encouraged to submit sponsor applications by Sept. 22. Learn more about becoming an externship host.